This collection of episodes have been reclaimed from the 1960s and 1970s Gumby television show. 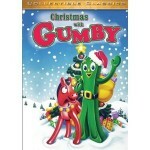 The DVD has 4 episodes on it that demonstrate the holiday spirit with the every friendly, every fun Gumby and his pal Pokey. They were originally aired in the 1960s and 1970s but have been digitally remastered and reclaimed from the old versions – with the original music (not the 1980s music from the reruns).